Turn an old tire into a garden planter to make an environmentally friendly and cheap addition to your garden, yard or patio. Disposing of old tires is a growing problem. While some tires are recycled into rubber mulch and other items such as door mats, one of the easiest ways to recycle unwanted tires is by making them into garden planters. When you turn an old tire into a garden planter you are creating a versatile addition to your garden while reducing the requirement to recycle or dispose of the tire. While tire planters may not be as attractive as other forms of garden planters, they can easily be disguised by growing trailing or bushy plants. If you don't have any old tires that are suitable for turning into garden planters then ask around. Many people are delighted to pass their used tires on to other people as this saves them having to arrange to dispose of them. One of the easiest ways to turn an old tire into a garden planter is simply to place one or more tires on the ground and fill these with soil or compost. These make great planters for flowering plants, however it is not recommended to use them to grow vegetables because of chemicals leaching from the rubber. The tires can be decorated by painting them with brightly colored paint for a fun and funky look or left plain for a more subtle addition to your garden. The size of the planter can be varied by adding more tires. Stacking two or three tires can give a planter a substantial depth making it ideal for small shrubs. 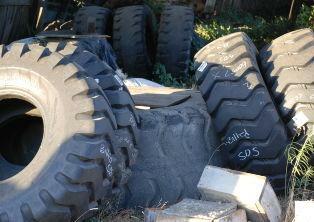 A number of tires can be used to make a raised bed. This is an ideal planting arrangement for people who find bending down difficult. The tires can be arranged formally in lines, or can be staggered to give a more organic feel. It is best to secure stacked tires to reduce the risk of them getting knocked or falling over. Tire planters are ideal for no-dig gardens. Large tires can also be used as a compost bin. The thick walls of the tires help to insulate the compost and keep it at an optimum temperature. More tires can be added as required. While this might not be an attractive form of compost bin, it is cheap and a good way to use unwanted tires. If you don't want to turn an old tire into a garden planter then why not buy one! Recycled tire planters are often sold at garden supply stores. They are also popular at craft markets and many crafts people and artisans make and sell items that have been created from recycled materials. Many artisans are also happy to take commissions and will custom make a tire planter to meet your requirements. Using tire planters and other recycled items in your garden is a simple step towards living a more environmentally friendly lifestyle. There are many steps that we can take as individuals and collectively to reduce the negative impact that we make on the environment.